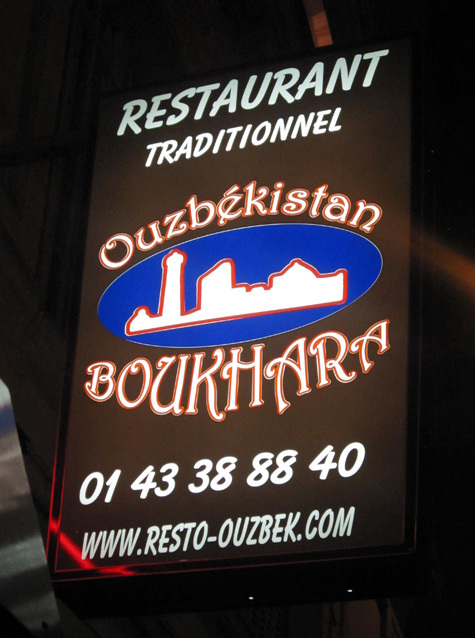 Boukhara (or Bukhara, in the English transliteration), one of the very few Uzbek restaurants west of the former Soviet Union, has 2 locations in Paris, in the 9th and 11th arrondissements. We visited the latter, a hole-in-the-wall a few minutes’ walk from Bastille. Don’t come if you’re in a hurry. The day we visited, there was only one waiter and one cook, which caused considerable delays. The food, however, is well worth the wait. 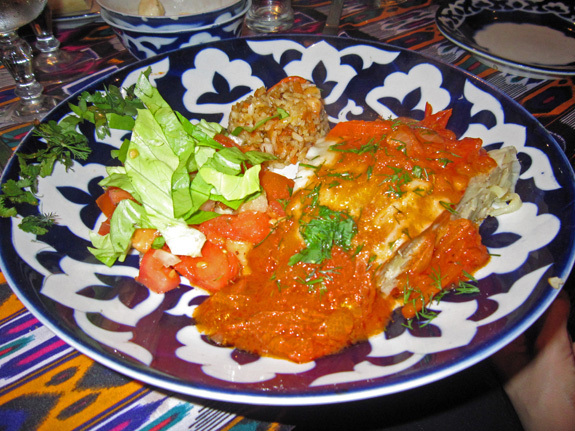 The menu is fairly short and covers all the traditional dishes. Appetizers (salads, samsa, manti) and soups fetch around 7 €, while entrées such as plov, lagman or lamb chops cost about twice as much. 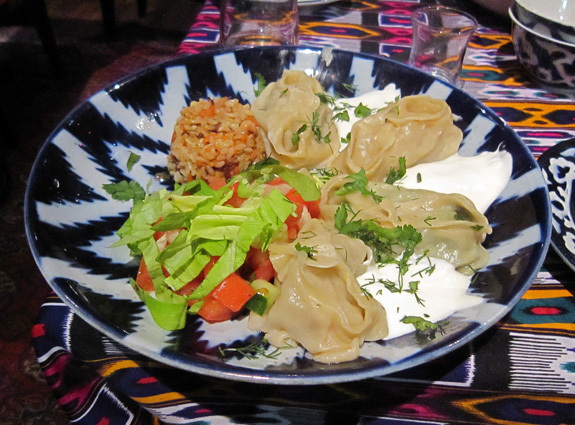 First came the chuchvara, small, juicy lamb dumplings in Turkestan creamy tomato sauce. Very good. You’ll soon notice that all the dishes follow similar plating layouts: blue plates (a rarity in restaurants), the main element with shredded herbs on top, a tomato and lettuce salad, and often a small side of plov. The manti contained a similar mixture in a larger format. Again, the juicy and tender filling made the dish a success. 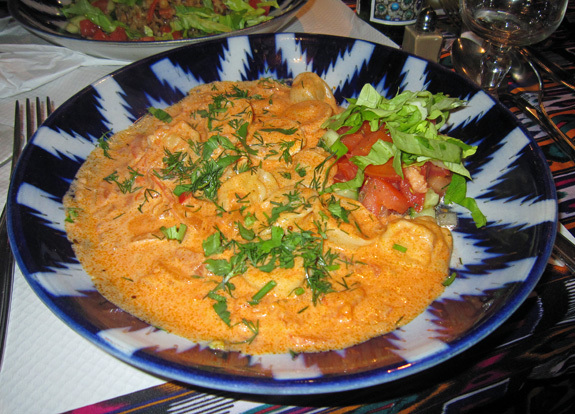 The hanoum, a dish I had never heard of, was described as steamed Uzbek lasagna with lamb and potatoes, topped with the same Turkestan sauce. It was pretty rustic but it didn’t disappoint. If anybody has a recipe for it, I’m interested. 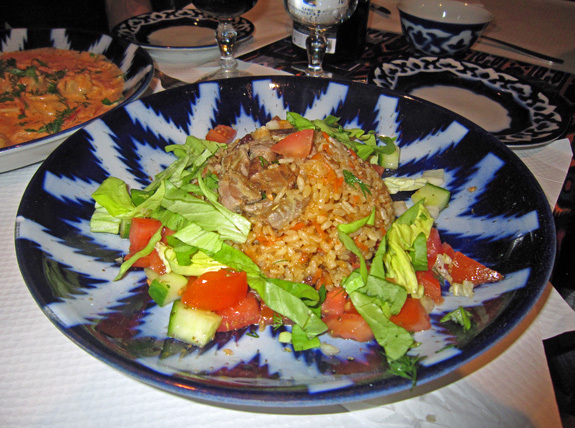 Of course, we had to try the plov, with its satisfyingly greasy rice, and pieces of lamb. Good, certainly, but not the best one I’ve ever had (that would be in Moscow, but then, I haven’t been to Uzbekistan… yet). You can wash down your food with Georgian red wine (decent) and vodka, some of it house-infused with watermelon. Sadly for an Uzbek restaurant, the tea options were simply tea bags. 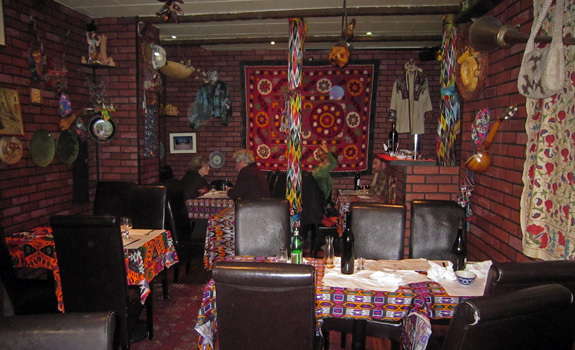 If you want to discover Uzbek cuisine (and if you like lamb! ), I’d definitely recommend a visit to Boukhara. The classic dishes, though simple, are all solidly executed. How interesting, I thought they don’t use tea bags. They have such a long tradition, even a ritual of preparing tea, then drinking it. 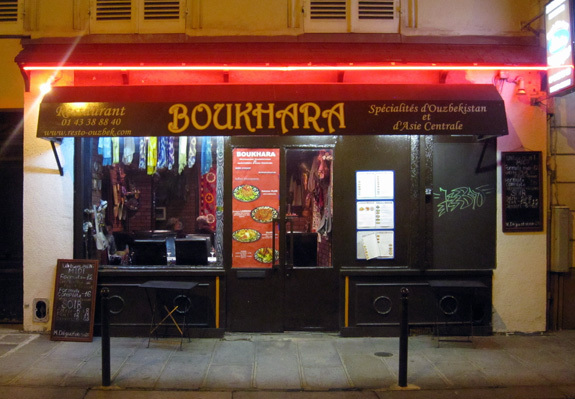 Great post, I love coming here to read about your experience with different cuisines. Good luck with your restaurant, please let me know how it goes!